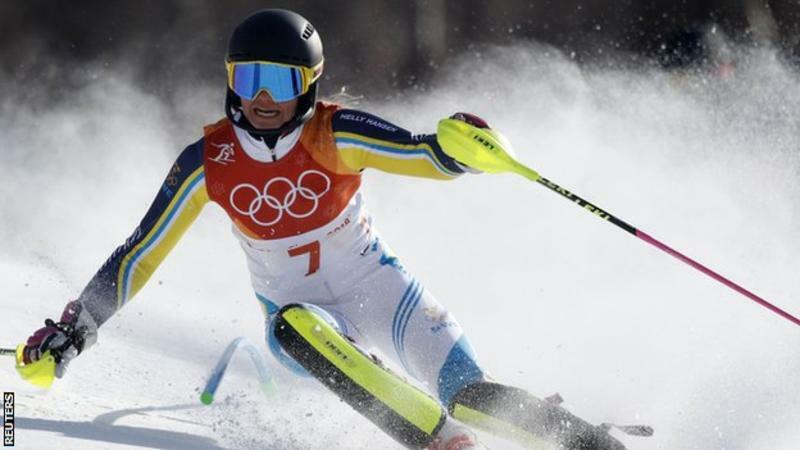 Sweden's Frida Hansdotter won the women's slalom as favourite Mikaela Shiffrin missed out on a second gold of the 2018 Winter Olympics. Defending slalom champion Shiffrin, who won the giant slalom on Thursday and was aiming for four golds in Pyeongchang, finished fourth. Hansdotter, 32, took gold by 0.05secs from Switzerland's Wendy Holdener, while Katharina Gallhuber won bronze. American Shiffrin, 22, said she was unwell after her first run. Great Britain's Charlie Guest finished 33rd.